Seals were the most common animal seen, with many spotted around London’s Canary Wharf, probably because many people spot them from its skyscrapers. Joanna Barker, ZSL’s European conservation projects manager, said: “Many people looking into the Thames see a murky, dirty environment. Just 50 years ago, the Thames was so polluted it was declared “biologically extinct”, too dirty for anything to survive there. But the public sightings confirm that the river is springing back to life. And many animals are venturing further into the English capital’s waterway. A whale even visited central London in 2006, but the bottle-nose did not survive. Other, healthier whales have been seen around Gravesend in Kent. “The fact we get so many sightings in central London suggests the fish stocks are moving in to support these marine predators,” said Miss Barker. In addition to the public’s reports, the team at ZSL has also been conducting detailed seal surveys along the greater Thames Estuary. For the last three years, they have used planes and boats to count the number of seals along the river. 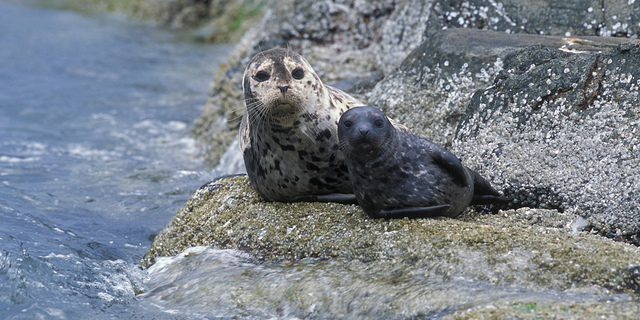 The scientists estimate there are about 670 harbour seals along the estuary. The number of grey seals is not known, however they appear to be doing well in this stretch of river. “We do think this area is really important,” said Miss Barker. “It’s quite sheltered compared with the North Sea, and there is a whole different range of environments and habitats for the marine mammals to use. “So we think that London and the Thames Estuary is an important environment for these species. The public are being asked to send their marine mammal sightings to ZSL.